Pizza is a happy food. Often the baseline of party cuisine, it is the delight of children, the daily bread of college students, and saving grace of fathers and some mothers who don’t cook. There is a certain warmth and nostalgia that comes with this comfort food, which cannot be explained but only felt, feeding the soul as well as the body. Really, I’ve never met anyone who doesn’t like pizza. I remember my younger cousin reaching for his mom’s pizza even before he had teeth. My great-grandma was the picture of all things genteel and proper, and the only time I remember her drinking beer was with pizza. My aunts and uncle have treasured memories of making pizza with their grandpa when they’d stay the night at his house, with his secret recipe for the dough. He only shared his secret recipe with my dad – decades later, he still won’t tell how to make it. A dear friend of mine grew up with the family tradition of homemade pizza every Friday night. My husband and I had our rehearsal dinner at Marion’s, the best pizza in Dayton. (There are multiple area locations, but Englewood is my favorite.) Whenever out-of-state family, myself included, comes back home for a visit, forget Mom’s home cooking, we go back to our favorite pizza places. My point is, pizza is for everyone, and times are truly rare when it isn’t attached to a good memory. Like most take out foods, it’s significantly cheaper and tastier to make your own at home, and what’s more, you can make it however you want. Everything from the classic pepperoni, to pizzas with alfredo sauce instead of marinara, BBQ pizzas, or even with a pesto base, the sauces and toppings are endless. You don’t have to stick to the typical mozzarella, either. Nearly any cheese can do well with the right toppings. Don’t be afraid to try something new. Pinapple, sour cream, and almond slices make a surprisingly tasty pie. I’ve seen crab and Old Bay pizzas. Think of the dough as a giant plate, ready to be loaded with your favorite flavor combinations, and possibilities are infinite. Even better, pizza is something that you can make with your kids. Cooking as a family makes wonderful memories, whether it’s brunch on a Saturday morning, Christmas cookies, or a weeknight dinner. Statistics show that kids who get into the kitchen early in life are more likely to make healthier choices later in life. Teaching kids to cook also fosters creativity, self-esteem, independence, taking pride in your work, and mad skills in the kitchen is bound to impress a significant other later in life. I don’t have kids, I’m no parenting expert, but if you have young ones, I implore you, don’t miss out on cooking with them. Pizza dough is easier to make than you think. Found in The Joy of Cooking, this recipe takes a while, but for as good as it is, it’s completely worth it. Only five ingredients make enough for two pies. If you don’t plan on making two pizzas, dough will keep in the refrigerator for about a week. This is easiest done in a stand mixer (my BFF of the kitchen), but I’ll tell you how to do it by hand. Homemade pizza doesn’t have to be round, so long as the crust is your desired thickness. Pour the warm water into a large bowl, and add yeast. Let stand until yeast dissolves, about five minutes. Then add 3¼ cup of the flour, salt, and olive oil, knead for about 10 minutes until dough is smooth and elastic. If the dough is too sticky, add the extra ¼ cup flour slowly until it is the right consistency. Form into a ball, coat with oil, (so that it won’t stick to the bowl) cover the bowl with plastic wrap and let rise until it has doubled in bulk, about 1½ hours. When the dough has risen, divide it in half, roll each into a ball, wrap in plastic wrap and let rest for another ten minutes. Sprinkle with flour, spread onto a baking sheet, and load with desired toppings. Bake at 475 degrees for 10-12 minutes. If you’re the sort of person who likes to try something different, try this taco pizza. I got my inspiration from the Pioneer Woman, and a fridge full of enchilada leftovers. I don’t expect all y’all to have to make a Mexican dinner one night just so you can make this pizza the next, so I’ll tell you how to make everything in one shot. Like all things pizza, some ingredients are completely subject to taste, you can swap out whatever meat or veggies you’d like, and hike up the heat level to your desire. ½ can black beans (mashed) or refried beans. While your dough is rising, brown the hamburger. While that is browning, dice your pepper and onion. Drain your beef, then add the diced veggies, and continue to cook until soft. Stir in spices. 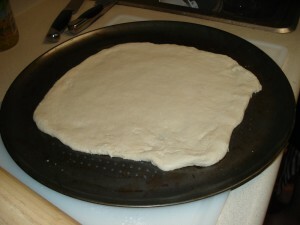 When the dough is rested, ready, and sprinkle with flour and spread onto the pan. Slather on the beans, enchilada sauce, topping it with the taco meat, cheese, and hot sauce. Bake at 475 degrees for 10-12 minutes. When pulled from the oven, add optional lettuce and tortilla strips. As with any pizza, let rest a few minutes, to let the gooey cheese set up. This way, when you cut into slices, the toppings don’t slide all over the place. Did you know, pizza has been eaten by the Italian people since 1000 A.D.? It was sold as hearty street food for peasants at breakfast, lunch, and dinner, sold by the slice, the pie, and even by the pound, according to Try This by Danyelle Freeman. Also, three different crust styles are used to make pizza. The standard crust everyone normally thinks of right away is the Neapolitan, generally thin on the bottom with a thick edge. The thin crispy crust from edge to edge is the Roman, and the thick crust normally associated with Chicago deep-dish pies are Sicilian, although a true Sicilian is a square pie cut into square pieces. Tip of the week: Love deep dish pizza? Coat your favorite oven-safe skillet with non-stick spray, and push your crust into it. Load it with all the toppings you can stand, and bake just a few minutes longer at the same temperature.